The first Poster Monday spot of the day goes to Ali Masumbeigi from Mashhad, Iran for his poster entitled “Peace Not War”. Ali has a Bachelor Degree on Graphic Design, and currently works as an Art Manager and as a Creative Graphic Designer at “Meded Noghreei” studio. His work has been featured and exhibited worldwide in poster competitions and events such as; Seed of Peace 2012, Positive posters 2012 and Poster Art: energy efficiency 2012 to name a few. 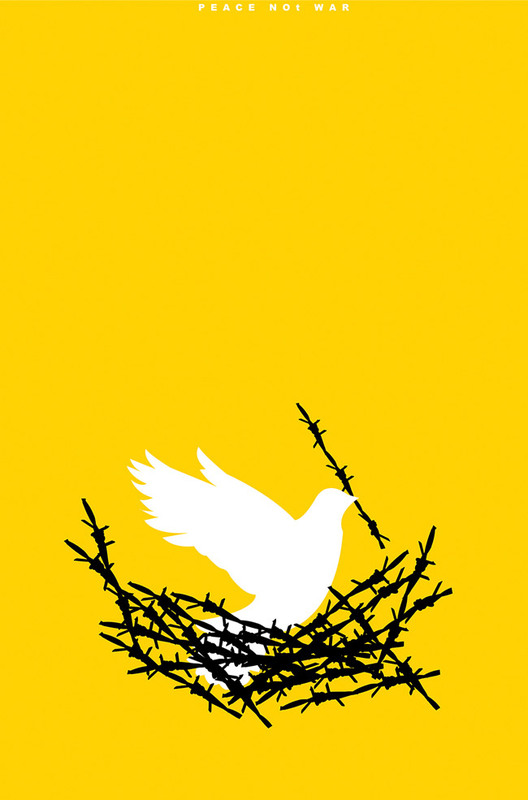 The poster “Peace Not War” has a dual approach says Ali, “In first place the bird is the expression and a symbol of peace but it also indicates an oncoming war and represents the community in crisis and during war times. The second interpretation/approach talks about the people who are living in captivity of war, those who can’t move or get away from this horrible situation”. The idea for this poster was in Ali’s mind since young age when he saw a few birds trying to build their nest in a residential area. For designing the poster he did a few sketches and schemas to find an appropriate composition and to link the text with the creative idea. Finally, after selecting the schema used digital techniques and pixel retouch software for completing the project. If you would like to see more from Ali visit his site at ali-masumbeigi.com. Mr ali masumbeigi is a active and positive man, and this is a reason for proudly for me.